Hi Guys, at present time we have to communicate with each other by sending the messages . There are lot of messaging apps available on the internet which provide the facility for instant messaging . Today we have to discuss few top instant messaging apps for Android and iOS phone users. In this article we have to discuss five top instant messaging apps for Android and iOS phone. With the help of these apps you will be able to send or receive text, audio, video messages to one or group of persons at the same time. You can also make free calls to other person’s with the help of these apps. 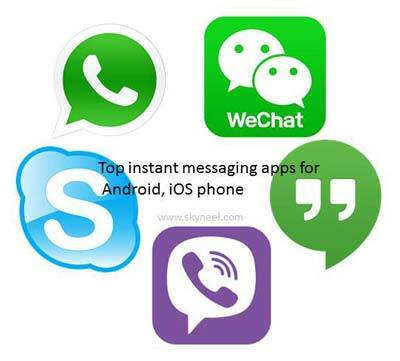 Have a look about the few five instant messaging apps for Android phone and iOS. All we know very well about the WhatsApp. WhatsApp is one of the most popular instant messaging apps for Android and iOS phone. There is no need to give full description about the WhataApp. There are billion of users day to day use WhatsApp in his smartphone. WhatsApp used to send or received text, audio, video, images, emojis, stickers and many more to each other. If you have WhatsApp facility in your phone then you will be able to make free call to other person who also use WhatsApp in his Android phone. If you want to send any message to more than one person at a time then you can easily create a broadcast group, which we already discuss in previous article. Google Hangouts another very popular instant messaging apps for Android and iOS phone. Hangouts is used to send and receive messages along with place a voice and video call also. With the help of Google Hangouts you will be able to send messages to any single or a group of persons at a time. You can easily send or received messages with the help of Google Hangouts either from your PC or from Android phone. When you login with your Gmail account then you can easily send any message, make video to other person with the help of Google Hangouts. After getting the huge success and publicity on the desktop, Skype is one of the most popular instant messaging apps for Android and iOS phone. Skype is used for video & voice calling. You can also send messages with the help of skype to any other person or more than one persons. If you want to send any video & voice calling messages to one or group of person’s then first you have to login with the help of username and password. You can easily search any important conversations or any contacts on the skype. You can also call to any landline or mobile number at a low cost. Viber is another most instant messaging apps for Android and iOS phone. Viber is used to send any text, photos, voice, video messages including different stickers and emojis to other users who also have viber in his smartphone. There is no need to pay any extra charges for sending messages to other viber users. The new viber provide the facility to call any non viber mobile or landline number around the world. First you must have to setup viber on your sim card bcz viber uses your phone number to login. Most of the person does not heard about the WeChat. WeChat is one of the biggest instant messaging apps which is mostly used in the China. WeChat is free to use instant messaging app which is available for Android and iOS. With the help of WeChat you will be able to send messages, video and voice calls, chat with single person or group of person, send images, audio, video, stickers, emojis during the chatting. You can also search your friends to start chatting on WeChat. I hope you like this article, it helps you to choose instant messaging apps for Android and iOS phone as per your need. Kindly share this article with others and start chatting and communicate with others by sending messages including text, audio, video, emojis and many more. Give your important suggestions in the comment box regarding this article. Thanks to all.